When you choose a direct lift, hydraulic attachment system for your snow plow you get a reliable and easy to use system that features quick hookup and detach capabilities. However, there are some myths that hover around this kind of system that need to be dispelled. Primarily, some say that in the rare event of hydraulic failure, you will not be able to get your direct lift snowplow elevated for transportation. This is simply not true. Just like a chain lift system, you can strap your direct lift system up with a ratchet strap, something that most snow removal professionals have in an emergency parts kit anyway. Even if you have a chain style lift, you should have a ratchet strap handy. If your chain fails, you will have no way to lift the plow or if there isn’t enough snow to ride the plow up to short chain your chain lift system, you’ll need a strap to transport the plow. First, remove the upper pin on the lift cylinder. Then, using a BOSS Ratchet Strap from the emergency parts kit or one with an equivalent minimum working load limit of 3335 lbs., feed the strap under the lower end of the lift cylinder, then up and over the lift tube on the coupler. Do not attach the strap to the light bar, as it is not equipped to handle the weight of the plow and could result in damage or the snow plow dropping unexpectedly. Route the loose end of strap into the ratchet slot, and pull tight. 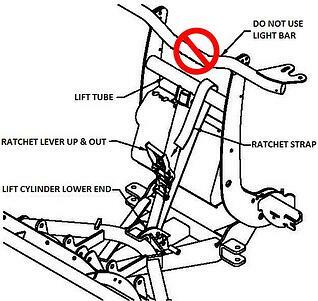 Be sure the ratchet strap is clear of hoses, fittings, and electrical wiring before tightening. If any hoses or wires are caught with the strap it could result in binding or pinching of the wires or even hydraulic hose rupture. Tighten the ratchet strap until the plow is off of the ground. Remember not stand in front of the plow blade when tightening the ratchet strap. Stand behind the blade next to the coupler. Keep your feet clear of the blade at all times. You never want to be under a suspended snow plow in any situation in case it unexpectedly drops. Direct lift hydraulic system or not, you should always have an emergency ratchet strap handy when you go out to tackle the next storm. BOSS offers an emergency parts kit that includes a ratchet strap, along with many other parts in the event that you need to make an onsite repair. If you have any further questions visit our technical service page or give our service team a call at 800-286-4155 ext. 2.